During coagulation, liquid aluminum sulfate (alum) and / or polymer is added to unprocessed (raw) water. When mixed with water, this causes small particles of dirt in the water to stick together or thicken. Furthermore, groups of dirt particles stick together to form larger and heavier particles called flocs which are easier to remove by settling or filtering. When water and floc particles develop through processing, they move into a sedimentation basin where water moves slowly, causing heavy floc particles to settle to the bottom. The floc collected at the bottom of the basin is called a sludge, and is channeled to the drying of the lagoon. In Direct Filtration, sedimentation steps are not included, and floc is removed only by filtering. Water flows through filters designed to remove particles in the water. The filter is made of layers of sand and gravel, and in some cases, the anthracite is destroyed. Filtration collects dirt that is suspended in water and increases the effectiveness of disinfection. Filters are cleaned regularly with backwashing. Water is disinfected before entering the distribution system to ensure that disease-causing bacteria, viruses, and parasites are destroyed. Chlorine is used because it is a highly effective disinfectant, and residual concentrations can be maintained to prevent possible biological contamination in the water distribution system. Solids that are collected and allowed to stand from water with sedimentation and filtration are transferred to the drying lagoon. Water fluoridation is a community water supply treatment for the purpose of adjusting the concentration of free fluoride ions to an optimal level sufficient to reduce dental caries. 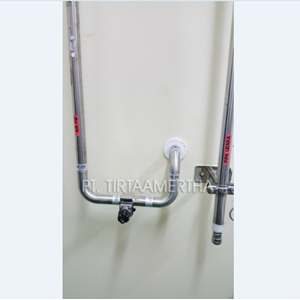 Lime is added to filtered water to adjust pH and stabilize natural soft water to minimize corrosion in the distribution system, and in the customer's pipe. 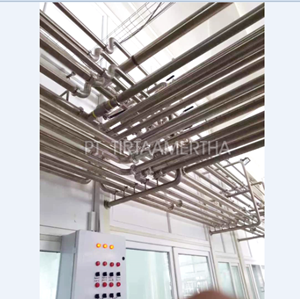 Equipment for piping systems with point of use using a variety of valves.